Be inspired to visit the the Japanese Garden in the Asiatic Arboretum of the the Sarah P. Duke Gardens. Charles Murphy interviews Matt Luks-Jurutka, Assistant Horticulturist at the Asiatic Arboretum. Have you been to Sarah P. Duke Gardens on the Duke University campus in Durham? Recently? In the past month? The Gardens are continually evolving. The W.L. CULBERSON ASIATIC ARBORETUM is no exception. Installation of the Japanese Garden in the Asiatic Arboretum is progressing nicely. Just across the arched bridge in the Asiatic Arboretum you approach the Garden and the Pine Clouds Mountain Stream (Sho Un Kei). Listen as Extension Master Gardener Volunteer Charles Murphy visits the Japanese Garden with the curator, Matthew Luks-Jurutka and they describe Garden features for listeners. The Japanese Garden borders a campus drive so there are muffled sounds of University buses. As you listen you hear children and other garden visitors. Especially enjoyable are sounds from the Garden’s waterfall and resident frog. Now close your eyes and visualize the Garden’s features. 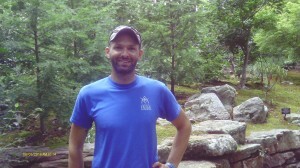 This is Charles Murphy and I’m here at the Pine Clouds Mountain Stream section of Duke Gardens in Durham. This is the most recent section to be completed. It is abutting the Asiatic Arboretum and has been sort of an extension of that if I understand it correctly. And I’m here with Matt Luks-Jurutka. Matt, can you tell us a little again about how this started and what the concept behind it was? Sure thing, Charles; my name’s Matt Luks-Jurutka, and I’m the assistant horticulturist here in the Asiatic arboretum. I work with Paul Jones and Michelle Rawlins. This project began as an idea about 5 or 6 years ago. Just in discussion with Paul, a local designer up in the mountains and Sadafumi Uchiyama, who’s the curator of the Portland Japanese Garden. They had discussed about incorporating moss and boulders in addition to the teahouse that we have existing here. The idea was to incorporate moss and boulders into the Japanese garden here. That progressed over time and Sada talked and conversed with Paul more about it, and it became a reality when Sada drew up the designs for it and funding started being sought in about 2013. It began with a small stream over by the teahouse which is supposed to represent a small stream you would see—a meandering small stream up in the mountains of North Carolina—quiet, peaceful, a moss strewn boulders, little babbling sounds coming from it. Then farther down is where the waterfall feature was added in. This is supposed to represent more of a garden in Japan and the mountainside or landscape in Japan, a tumultuous, volcanic landscape in Japan, this sheer mountainside and the waterfall coming down out of that. The idea of the garden is to be a ruins garden. You go to Japan a lot and look at these beautiful gardens that have been there for hundreds of years. It’s almost a ruins garden, technically, because it’s a garden now but they are preserving a ruins, but they don’t call them ruins gardens. You can see the old footprints of where teahouses and temples and castles used to be. And that’s what we wanted to recreate here. We wanted to kind of push the envelope like we do in a lot of the areas in Duke Gardens and create something different and interpret it differently. So what we did here is we added some footstones, an old path. There’s an old broken roadway with a large 40-50 foot pine growing straight up out of it and the stones are pushed up like this seedling just came up out of the roadway. So it’s supposed to represent what used to be here, and this was an old garden, maybe in front of a teahouse or in front of a residence and the people enjoy and we’ve recreated, almost, and maintained it and have other people enjoy it. Alright, so then, you have done both a new thing and used it to accentuate an old thing, and then embodied both parts of that culture—the more recent gardens plus the older gardens that do go back for hundreds of years. Now, I was looking at the stones here. We’re in front of—is this the end of the waterfall? —the lower end of the waterfall. I was looking at the stone on that and then back up in this direction is the hillside. In Japan, this would be a natural topography in the mountains—the rock, and the soil, the vegetation. But much of that was not natural here, is that correct? Was there a lot of construction that needed to be done for this? That is correct. The topography was here, luckily. There was really just like poison ivy, trash trees that we call them, just seedlings, ligustrum, really nothing interesting. It used to be a cut through where the doctors would cut up the hillside there; it made a little dirt path to get up to the hospital. There really wasn’t anything here but the topography. That was something that we had going for us, which really helped. We had a really excellent team from Greensboro come in—contractors—and they did a lot of the stonework. Sada came about half a dozen times to place the large boulders once the waterfall—the frame was constructed for the waterfall. He placed the large boulders because in Japanese gardening and culture, the large stones represent—they have a high symbolism factor where they represent kind of the relationship between heaven, earth and man or humans. It also anchors the garden down to the landscape, and so it creates the drama, is what it does. You put all these smaller stones in that were the same shape and size, you know, it doesn’t really strike you as something—it doesn’t have the same impact whereas these large boulders, some of them weighed about 8 tons. We had a crane in here that was lifting them up the hillside. Luckily we had a crane, because like I said, we had the topography going for us, and trying to get those up there by ourselves would have been a doozy, so the crane lifted the stones up and Sada—he’s got the eye for it—and he would have you move these cables an eighth of an inch and he told us than an eighth of an inch movement could shift 500 pounds on that boulder. If you didn’t get it in just right, he would have the crane guy take it down. It was supposed to go in that way and if it didn’t it was back down on the ground and we were trying it again later. It was a great process and luckily we had a lot of the natural pines here, and that’s how we named the garden eventually. We tossed around a bunch of ideas but we settled on “Sho Un Kei”, in Japanese translates as “Pine Clouds Mountain Stream”. We wanted to preserve a lot of these native loblolly pines that tower above it. Like I mentioned about the stones; they really anchor the garden to where we are. I think that’s one good thing that Paul really focuses on here; the arboretum is about the relationship between disjunct species—species that you find here that are also only in Asia. We try to represent that. I think he does a really good job in interpreting this Japanese garden differently than most people would. Everything is not super-sheared, pruned and manicured. It really anchors you down to where we are. We are in North Carolina, the southeast. The pines really, in effect, have the same impact as the stones do in that way, just in a different vision. That’s very interesting. It brings up something I was thinking about as you were talking about the large boulders and the mature trees being structures that don’t ground the entire garden area and the relationship between the stones, the trees, the natural world and people, which is something that we often don’t seem to combine, or at least be aware of, in many of our more formal gardens around the United States, at least the ones I’ve visited and there are some that are just gorgeous and they are very beautiful, but the sense of structure is different or seems to be different in many ways. This embodies a more melded concept. We are struggling with interpretation – so where we want people to start coming in. We are going to put in a sign—we are trying to figure out how to tell people what this is, and how much is too much information. There are aspects here that are definitely Japanese; you have the stone-work. Islands are a big theme in Japan, even if it’s not in the middle of water, if it’s surrounded by gravel. We have an island with some three small azaleas and some cobble on a raised mound, with a beautiful Japanese black pine, which is the first thing you see when you walk up around the corner. We have aspects, but people will come in when I’m working in here and they are constantly like “Where’s the Japanese garden?” And I’ll have to be like, “You’re in it!” A lot of people have this idea of what it should look like. I mean, I understand that. They are beautiful, but we are going for something different. We are going for something that is not so manicured and not so influenced by human hands. You can see that some of the pines, of course, have to be trained and pruned every year, so there are these elements that you can see that people still have their hands on, but we are also letting it be what it naturally would be if it was neglected for hundreds of years. It’s a juxtaposition that we are trying to maintain; that we are trying to interpret for the public, as well. So it’s a challenge! But a garden is an evolving structure, anyway, or should be. This happens; things do change; trees grow larger. Pathways that were once open are closed or new pathways are made and it might be a little overblown because of the living thing, but nevertheless it is in some ways, in many ways. It seems to have a life of its own over time. Now you were talking about Sada—is that the name you used? Now, this is the person who came from Portland, Oregon. And that’s where the Japanese garden is that is supposed to be one of the premiere ones or eminent in the entire country, or maybe THE one. So he obviously had an expert eye and knew exactly what to do. What else is here? Can we move upstream? How do we go through here? I’m coming into the garden. I want to see this, but I want to see all of it. Which direction do I go? We usually come across the red bridge, farther over from where we are standing, which would be on the far right of the waterfall. There’s just a retention pond in that direction. We are hoping people won’t come in, but we did make a little entrance. You are usually supposed to come across the red bridge; you walk up along that cobbled pathway where that big stone wall is that is covered in moss. It’s actually supposed to represent—if you see this boulder here—once you turn the corner and you see the waterfall on your left, there will be a stone and a granite bench. And the stone on the left side of the granite bench is supposed to represent a dragon’s head. And the mound is supposed to represent a curled up dragon protecting the garden, which is a traditional symbol in Japan. So you’d walk up through here and then meander on through this waterfall that goes underneath the path and then farther up you’d come to this smaller stream which is a lot quieter—kind of helps you quiet down and center yourself. And then right past is the teahouse. That’s kind of the flow and the direction that we want people to walk. Can we just go that way and see how things look? We can both describe what we are looking at. We are going past the island that you mentioned, and the structures that represent the dragon, and moving toward the teahouse, is that correct? That’s correct. And these Japanese maples that are scattered throughout here—we were lucky enough, this is another reason why things just fell into place when building this garden. All this moss here on this mound, I put in. I had to make the contours, pack clay underneath and make it look like there’s an old log underneath there. This was all from a rescue from a family in Raleigh that bought a house and turned out needed to be torn down for structural issues and asbestos problems, so they had an immense amount of moss out front. They called us and we would go and cut it out like almost sod and roll it up and come back and unroll it. That was given to us and right before that we got a gift of all these Japanese maples which at a nursery would be thousands of dollars. They are pretty established and mature. So having to recreate this garden with things that we would have purchased would have been very challenging. And things, just like I said, just fell into place. You can kind of appreciate that it already has aged once we put it in. Which these trees add, and the moss adds, and these stones. If you look back; if you come up to the path, right up to the top of the stairs and look back, you get a really nice view, borrowed view of the lantern, looking back down towards the waterfall, the stone lantern that’s there and the really nice angle of that pine that you wouldn’t see if you didn’t come up here. You really see the trunk really well, and that’s part of the art of doing these trees is that they’re almost living art forms, as well—the bark and the structure is just as important as the function of the tree. So you have been training your pines for years to get the zigzag? Yes, these pines actually came in at the end of the summer right before we dedicated this garden in October. We were kind of a little push to put them in, because they really made the bones of the garden. We had everything in and these were some of the last things we put in. Once we put them in, we were like, “Wow!” This really brought it down—or brought it up—or brought it down to earth, kind of thing. So, yeah, they’ve been trained for quite a while and we bought those from a really great nursery on the west coast. They had already pruned them and trained them. They need to be manicured every year, twice a year—spring and fall. They are high maintenance, but they are beautiful. So is the idea to keep it basically like it is now in terms of size and space and what not? …plus continues the movement back and forth. Otherwise it will just grow up. So where you orient them, where you place them and then where you orient them depends on—pruning them is dependent on what you want them to do from that point. It’s just challenging because I have to look at next year’s growth, but I also have to look in five or ten years, where do I want this tree to be for the person who is coming behind me? So it’s like this kind of time-honored tradition of passing—like accepting something that a horticulturist has done for you, putting your name on it, having some creative license to it and then knowing that you are not going to see the end of this tree and pass it on to someone else to add their license to it as well. It’s a neat process. That’s a nice idea, though. It’s a continuum effect. I like that. So coming across this little wooden bridge towards the little stream, there are these two big posts. We’re still going to do some work on these. They are still fairly new looking and we are going to try to make them look like, in Japan where you see the old torii gates, this was like an old gate, but right now it looks like two posts in the ground. The slope here along the path moving, away from the waterfall and the flowing stream still looking at beautiful trees, Japanese pines, different plantings, the pachysandra on the ground, the stones, the pathway itself, and looking at a very nice magnolia directly in front of me, right now. Yeah, we made an effort to keep some of these. What’s this structure directly in front of us now? We are at the top of the path, a little quietly flowing stream to the left with a little pool at the base of it and there’s an open structure here in front of us. What is this? This is called an azumaya, and it’s just a little bench seating area. There are some really nice views in there of the red bridge. You can see the teahouse a little bit. We are still going to work on thinning out a little bit so you have a little more of these vignettes and windows. Like where we are standing now, we are about 25 feet short of the azumaya and if you look down towards the fence, you can see the red bridge through the trees, but it’s still pretty obscure, so we are going to work on thinning that out so you have a little window. That’s also another reason to keep coming back is you’ll start noticing more windows that we are going to open up throughout the arboretum, especially in here. The bench is actually situated. We planted this beautiful red Japanese maple on the far side of the pond up a hill that you wouldn’t notice. We cleaned out a little window and it has the brightest red color that’s amazing and we are just so happen that we placed the azumaya in the right spot to be able to see that. Now that’s another borrowed landscape, borrowed feature that you can sit and appreciate. One thing that I’m thinking that goes along with what you are saying is that this encourages me, now, to come back later in the summer, come back in the fall, come back in the winter and come back in the spring. So, I guess I’m sort of rushing through the year, but it’s going to be interesting to watch all of these changes as they happen. It definitely is and that’s one thing that I look forward to, too. Once we’ve got all these plants in. This is still a changing landscape—a changing garden. People are like, “Oh, you’re finished with the Japanese Garden!” Paul and Michelle and I look at each other and we’re like, “We’re not even close!” It’s just a continual effort and investment like the rest of the arboretum. This one, in particular, just because it’s pretty involved in maintaining it, but it is, it’s really great to see the springtime, and I’m excited to see it in the fall, and in the winter if we get some snow on these pines, it’s going to look amazing. It’s going to be a great time, even brave the cold and then come sit up on this azumaya with a jacket on. If it happens to snow, it will be great! You can watch the snow fall on the pond and all the maples. Alright, we are now standing in the azumaya, having come to the end of that path. I have a nice view of the red bridge. We’ve gone through the garden area. We’ve talked about it. You must—you just have to come and see it; it’s amazing! And because it is still a work in progress, so to speak, it is likely to become more so as time goes along. I just want to remind you that this is the podcast from the Extension Master Gardener series. This is Charles Murphy. Thank you very much for listening and come out to Duke Gardens; it’s a true jewel. Thank you! With this recording we hope you’ll be tempted to visit the Japanese Garden located in the Sarah P. Duke Gardens located on the Duke University campus. Pick up a map of the Gardens at the reception desk in the Education Center. Why not visit an area public garden this week.